I've never put too much thought into my shore power cord. It brings electricity from the dock to my boat, so what else is there to say? Sure, it adds another step to docking and undocking because the cord has to be screwed on or off the shore power connector on the boat, but without it we wouldn't have refrigeration or fully charged batteries for the next trip. As far as I know, shore power cords have pretty much looked and functioned the same way ever since I've been boating. That is until Marinco introduced their new EEL ShorePower. The acronym "EEL" turns out to be very appropriate because this new shore power cord truly has what is best described as an "Easily Engaged Locking System". If you've ever fought with cross-threaded rings, broken rings, or poor sealing when connecting to shore power, EEL ShorePower may come as a "Why did it take so long to come up this?" moment in your boating life. Marinco's EEL system eliminates the threaded locking ring completely and creates a watertight seal that can be attached quickly and easily with just one hand. There's no screwing, no threading, and no cursing! Simply open the "jaws" of the EEL cord, line up the blades and clamp it onto the rings on your boat's existing shore power connection. As an added bonus, the EEL cord features a blue LED light on top of the connector to show that the power is on and a second cleverly placed LED on the receptacle surface that acts like a flashlight to light up your connection! I love this feature almost as much as I love the one-hand clamping mechanism. 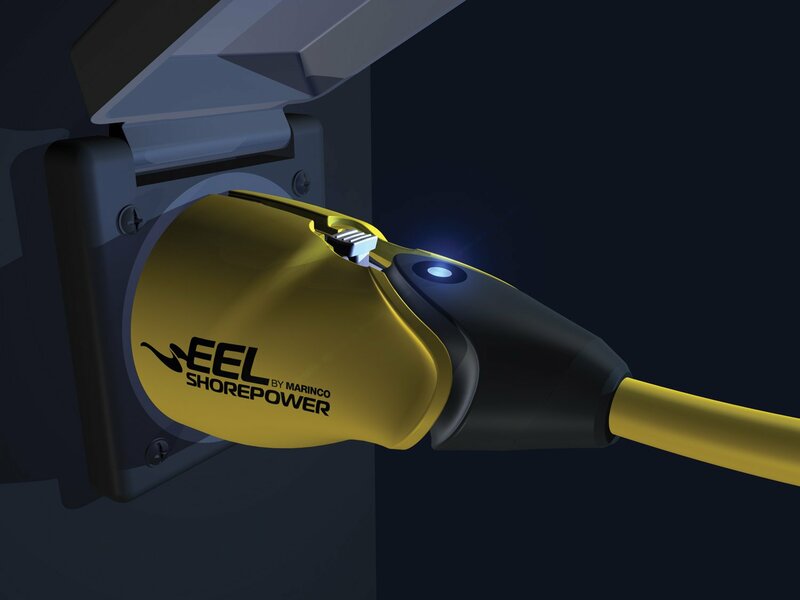 If it's time to replace your shore power cords, or if you're just looking for an easier, quicker way to connect, I highly recommend checking out EEL ShorePower. Who knew something as seemingly simple as a shore power cord could be vastly improved upon? Looks like a great product - and the LED is a stroke of genius. Thanks for the tip. It looks like the SmartPlug system's success woke somebody at Marinco up. Seems to be a nice product in a conservative category. The LED is a bit illogical though as the boat side should always be attached first for safety - it eliminates the chance of dropping the hot end in the water.